The Tufts University Women's Lacrosse program has returned to the national stage under third-year head coach Courtney Farrell. After narrowly missing an NCAA Tournament berth in 2014, the Jumbos advanced to the NCAA Round of 16 last spring. Farrell's 2015 team earned the program's first NCAA berth since 2011 and won a second-round game at Messiah 14-7. In the very competitive New England Small College Athletic Conference (NESCAC), Tufts advanced to the conference championship semi-final also for the first time since 2011. They lost to two-time defending national finalist and 2012 NCAA champion Trinity College 8-7 in overtime. During Farrell's first year at the helm in 2014, she directed Tufts to a 10-6 mark overall and a 6-4 record in the NESCAC. That improved upon the team's 7-8 overall record and 3-7 mark in the league during the season prior to her arrival. Tufts placed two players on the 2015 Intercollegiate Women's Lacrosse Coaches Association (IWLCA) All-America First team - as many as any team in the county - with Emily Wright and Caroline Ross. The Jumbos joined College of New Jersey, Cortland and NESCAC rival Middlebury as the four teams with two players on the All-America first team. The Jumbos not only succeeded on the field during the 2015 season, but were also one of the top academic teams in the nation. The IWLCA recognized the Jumbos as an Academic Honor Squad for 2015. The team is also actively involved in community service including the Yards for Yeardley and Big Sister of Mass Bay programs. Farrell had been part of the Cortland staff under head coach Kathy Taylor since fall 2010. She was promoted from assistant to Associate Head Coach in fall 2012. During her tenure, the Red Dragons played in three consecutive NCAA final fours from 2011-2013. They compiled an outstanding 62-6 overall record during Farrell's three seasons for a .912 winning percentage. The all-time leading scorer in Cornell University history, Farell played for the Big Red from 2006-08. She led the team in scoring for each of her four seasons and finished with 213 career points on 122 goals and 91 assists. She was an IWLCA All-American, a four-time All-Ivy pick, and three times an All-Region honoree. Farrell is a 2008 graduate of Cornell University, where she earned a bachelor's degree in applied economics and management. She immediately went into coaching, serving as an assistant at Division I American University for the 2009 season. She was then an assistant for the 2010 Ivy League runners-up at Dartmouth College. 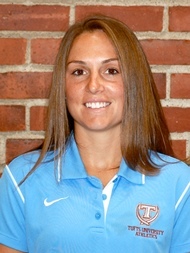 A member of the United States Development Team from 2006-08, Farrell founded and directs teamthirteen, a women's lacrosse specialty company which focuses on the development of fundamental skills and teamwork in girls and young women. She also spends summer working the top college recruiting showcases and instructional camps. Farrell became the sixth head coach of Jumbo Women's Lacrosse since the program was founded in 1975. Originally from Fayetteville, New York, Farrell is a 2004 graduate of Fayetteville-Manlius High School.